eBay and World Artisans, originally uploaded by whiteafrican. I’m at eBay Live!, the annual eBay conference, in Boston this week. 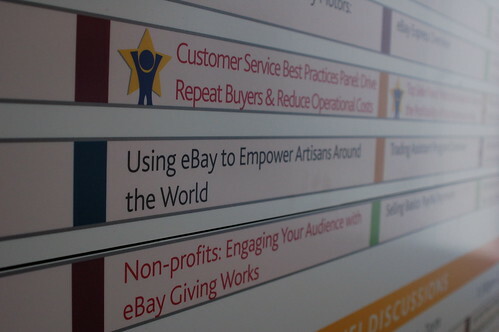 I took the opportunity to attend a session titled, “Using eBay to Empower Artisans Around the World”. In all fairness, I chose the title of this post due to my experiences with the “aid vs trade” debate at TEDGlobal last week. The general feeling around the session I was in though, was that people would only buy African products if they were sold with a story of “helping Africa’s poor and needy”. The basic idea is that eBay is working with Fair Trade organizations to certify NGOs, aid organizations and a few for-profit companies to source and manage products coming from places like Africa, and some places in Asia and South America. Organizations that are certified as “Trust Providers” will be allowed to do business. eBay, in coordination with World of Good, is setting up a specific marketplace for these third-world artisans to sell their inventory. The artisans don’t have direct access to this marketplace, instead they need to work through sellers in the US and UK to make the final sale – to complete the supply chain. This new marketplace is being marketed towards the LOHAS demographic (Lifestyle of Health and Sustainability), who is willing to pay 20%+ premium on products. There seems to be a great many supplier artisans around the world. What eBay is trying to do is increase the demand – an area where they see a gap in the chain – by providing a special place to “tell a story” about the goods. This is all well and good. Noble even. However, I think they’re missing something – or at least only looking at the problem from one angle. From what I have experienced talking to Africans all over East Africa, they want to sell their goods on equal footing with everyone else. They will use another charity platform, if that’s all they’re given to work with, but it’s not what they really want. That’s what I would like to see happen. Provide all of the tools that other international eBay regions get – like India. Treat Africa the same, instead of having special rules with watchdog “trust providers” to control the unruly and untrustworthy African. I’m torn, because I like that eBay is paying attention and trying to do something, but I’m a little put out by the attitude that Africa needs special rules. I don’t think that’s the case, I believe that Africans can, and will, perform on the world stage with everyone else. However, what the eBay team is trying to do is probably the right decision for them. In the end, they see Africa as a risk – and certain countries are hotbeds for fraud and eCommerce corruption. Maybe a more balanced approach would be to work in some type of direct investment play into Africans at the local level as well as these development groups. This view of Africa is very insulting. You have been around the continent and yes there is corruption; yes there is poverty; and yes we’re not a whole lot developed in comparison. But we are CAPABLE! Have you seen the acceleration brought about by more accessible Internet? And mobile communication? What we need is not pity. What we need is opportunity and information. The rest we can figure out. We have people right this moment racking their brains on how to begin an eBay, a Paypal, a Sega right here. And some of them are well on their way. So you’re right on target that those who wish to be part of the success story are better off making alliances. Charity will not be rejected, but that is not where Africa’s information age billions lie. One of the TED fellows Nii Simmonds has a website that does just what Ebay wants to do in Africa. It would serve ebay well to check out http://www.enubia.com/index.php and partner with people like him. I think it will take a long long time for the world to view African suppliers as competitive suppliers. There are many people around the world who cannot 5 countries on the continent. We are seen as that dark continent where everyone is destitute and everyone is a beggar. What can we do though as Africans to do this ? Maybe we should start a http://www.AfricaMatters.com and ask the blogosphere to put a banner across their blogs similar to the ‘make-poverty-history’ banner. In order to drive traffic to that site where the world can see all the positive contributions out of Africa and all the success stories ? I think we are all getting to sensative. We need to accept that as things stand at the moment we can’t just go out there an be competitive eg our lack of infrastructure makes transport costs excessive & we don’t have technology support systems to introduce whats standard out there. We don’t have to apologise for this and don’t have to feel its a slight when this type of shortcoming is identified. Lets use the offers with the clear objective of fixing what’s holding us back, so that we can be part of this new world. This post reminds me of my Dad and his habit of buying everyone’s christmas presents each year from Plowshare & Crafts. I have no problem with people buying legit goods & services from Africa (or wherever). But he buys this crap and foists it on people who have no need or desire for it. Sure it helps Africa’s GDP but the West’ll just end up with a bunch of white elephants! Annansi Chronicles » What’s your Africa strategy?